Discussion in 'Politics & World News' started by Toshi, Mar 19, 2008. At the request of election officials, the Ohio Bureau of Criminal Identification and Investigation has seized voting machines for forensic analysis and has launched a criminal investigation into the Franklin County Board of Elections. 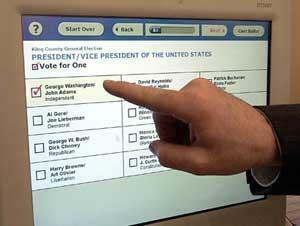 The investigation was launched after Jennifer Brunner, Ohio's Secretary of State and chief election official, found that a candidate's name was marked as withdrawn on the electronic voting machine that she used during the recent primaries, an irregularity that was also reported by voters in other precincts. The state attorney general is now working with a team of computer forensic consultants to determine if there was any tampering. According to WHIOTV, which conducted a television interview with Brunner, the state will consider dumping the faulty touch-screen voting machines and switching to more reliable optical scanners that read votes from conventional paper ballots. Rep. Kevin DeWine, a state legislator and deputy chairman of the Ohio Republican Party, vehemently opposes returning to paper ballots because doing so would likely cost the state an estimated $64 million. His arguments seem dubious in the face of the growing costs associated with cleaning up the messes created by the defective touch-screen voting systems. is it a requirement to be fundamentally corrupt to be a republican party official, or is that merely coincidence? Come on Ohio, give 'em back. There's a limit to being part of the political process. No, corruption is a requirement to be a politician. That Washington, what a hack, just repeating over and over "I cannot tell a lie" and banging on about that f*cking cherry tree. Policies Georgie baby, policies, none of this vague "truthiness" bs. Come on Ohio, give 'em back. I'm sorry, my munchausen acted up again.